This scene depicts postal employees loading the mail onto a railway post office (RPO). The RPOs were owned by the railroads, operated by the US Post Office, and delivered high speed mail across the country for over a century. This exclusive commemorative cover will receive the first RPO postmark in some 40 years and will be shipped to you via the Northern Pacific #1102, one of the last functional RPOs in North America! Your item will be postmarked 6 May, 2017. A letter of authenticity will also be included. This scene depicts Owney, the railway mail service mascot, sitting a railway post office (RPO) doorway. The RPOs were owned by the railroads, operated by the US Post Office, and delivered high speed mail across the country for over a century. This exclusive commemorative cover will receive the first RPO postmark in some 40 years and will be shipped to you via the Northern Pacific #1102, one of the last functional RPOs in North America! Your item will be postmarked 6 May, 2017. A letter of authenticity will also be included. 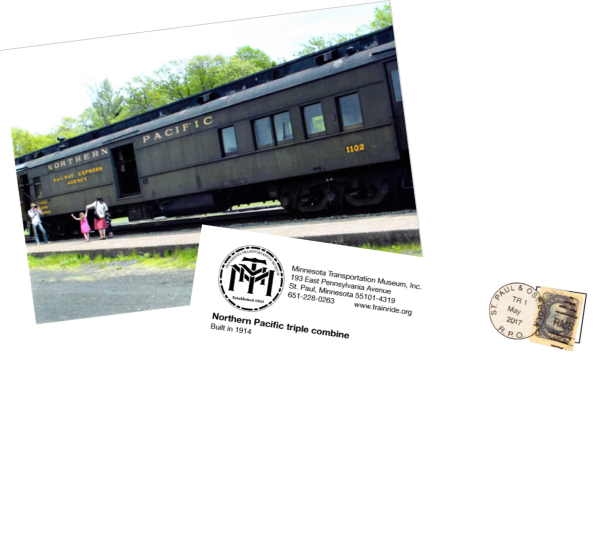 This standard postcard shows the Northern Pacific #1102, one of the last functional Railway Post Offices (RPO) in North America! The RPOs were owned by the railroads, operated by the US Post Office, and delivered high speed mail across the country for over a century. This postcard will receive the first RPO postmark in some 40 years and will be mailed to you via the Northern Pacific #1102! Your item will be postmarked 6 May, 2017. 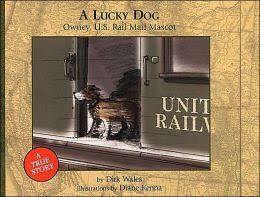 Owney was the U.S. Railway Mail Mascot! He loved the smell of railroad mail bags. He slept on them and rode with them to the train station in Albany, New York. One day he got a chance to ride a Mail Train! 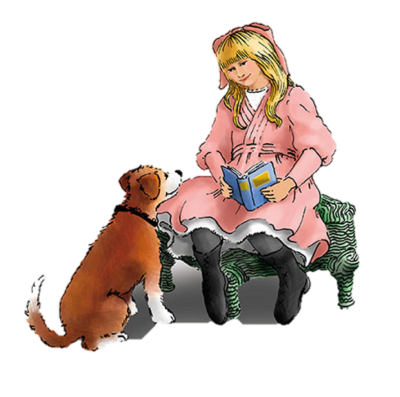 That was the beginning of Owney's travels on Mail Trains all over the country and his chance to make hundreds of new friends. As he traveled, postal bag tags were fixed to his collar by faraway post offices. Then, U.S. Postmaster General John Wanamaker presented Owney with a special harness for all his tags. Toward the end of his career, Owney traveled on mail boats and trains around the world. Owney was one Lucky Dog! This children's book is based on a true story! 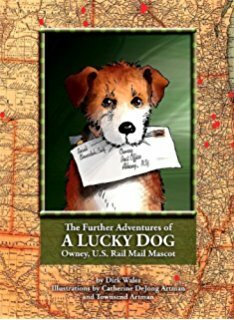 Welcome to Owney's second book, a book that hopes to give his many fans a wider view of his life as the most traveled dog in America --- 143,000 miles in Rail Post Offices (RPO). 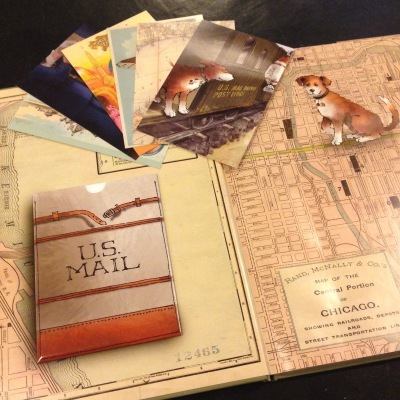 What we don't know about Owney, is exactly where he went and who he met on each trip. The amazing part of his story is that Owney traveled to all these places alone. He rode on mail trains from city to city, and inside a city, on any mail wagon by himself. So, this means Owney had a life, friends, and adventures that were not written down. Because he lived and traveled in a different time (1800s) he lived in a world that was different, more generous, and easier than the world we live in now. In a way, we can think of him as a dog who has come to tell us about this past world. Yet, in this book, it's as if one of us were traveling with him, watching this remarkable dog make friends and have adventures none of us could even dream of.